Home / Book summaries / The Church of Google? According to Nicholas Carr, the way in which Google is organized reflect Taylorist management principles, and the way its products effect us is not necessarily positive! 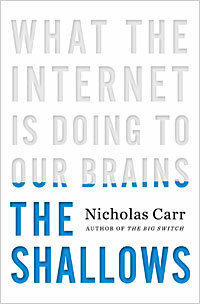 This is my summary of chapter eight of The Shallows: How the internet is changing the way we read, think and remember, by Nicholas Carr. Taylor’s principles of scientific management helped shape the organisational form of the industrial revolution. Probably the best known example of applied Taylorism lies in the Ford motor plants in North America, in which turning workers into automatons resulted in extremely efficient production. That subjectivity is an obstacle to clear thinking. What Ford did for physical manufacturing plants, Google is doing for the mind, applying Taylor’s principles to knowledge work. The way it ranks web pages…. Web pages are like citations… the value of any page could be gauged by the links coming into it. AND an incoming link from a page which itself has more links pointing to it is more valuable than a page with fewer links pointing to it. Larry Page realiszd early on that the relative value of any web page could be evaluated by a mathematical analysis of two factors: the number of incoming links to the page attracted and the authority of the sites that were the sources of those links. The company’s ads policy: placement is determined by the bid but also the frequency with which people click on them. Then there is the fact that Google’s control of data means, to some extent, it has control over what we see, over our intellectual lives! Carr also argues that Googles’ book digitization programme isn’t necessarily beneficial… To make a book available online is to dismember it. Fragment it. When carried into the realm of the intellect, the industrial ideal of efficiency poses, as Hawthorne understood, a threat to meditative thought. The ability of a well rounded mind requires reflection, not just the ability to find information quickly. We are now dependent on machines to filter information, it use to be human decision and time…. Out of a million books, only a handful would make it through the generations… Emerson again. For my summary of previous chapters please click here. To purchase the book (it’s a cracking read!) please click below!